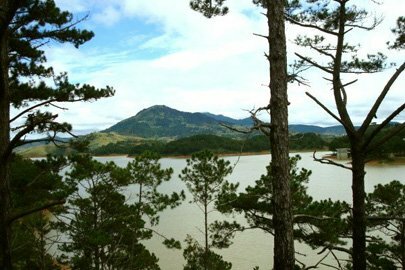 Around 15 kilometers from Dalat City, Nui Voi-Da Tien Tourist Area in my opinion is a paradise for travelers, as it is unlike any tourist areas in the city of mist and pine trees. I departed from the road from Prenn Pass through Truc Lam Zen Monastery, riding around Tuyen Lam Lake then upon the area. The windy and winding road is really interesting to conquer. ‘Da Tien’ (fairy rock) is two rocks in the shape of two male fairies playing chess. The greenness of the pine forest and grass-yards are dotted with some colorful wild flowers. After that you can enjoy some specialties in some long stilt traditional houses of Ede people with gong shows or chat with K’Ho people around the fire. All will make you ignore the darkness coming over the misty city and the chill of the wind. 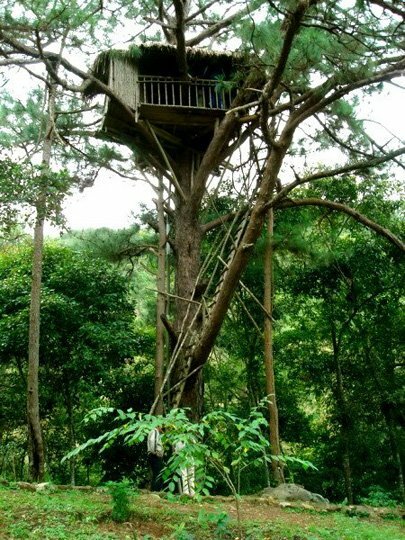 The amazing thing is that tourists will be taken to a little wooden tree-house halfway up a giant tree to sleep in overnight. You might be a little apprehensive at first but it does have a toilet and bathroom. Lying in the house like a bird cage you will hear the whistles from the wind through the leaves and buzz of insects. Early morning when you are awakened by the twitters of birds, you should take a visit to Voi Waterfall and stroll around the village to explore more of the ethnic culture there.